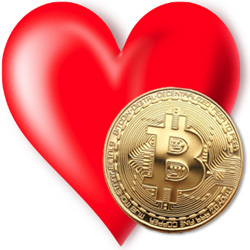 Online casino players love cryptocurrency so CryptoSlots.com -- an online casino that only uses Bitcoins, Bitcoin Cash and Litecoins for deposits and withdrawals -- has a special Valentines bonus for them. February 14 – 16, CryptoSlots is showing some Valentines love with cash top up bonuses up to $200 that can be claimed up to five times daily. CryptoSlots has 24 provably fair slots (7 of which are high limit versions), 9 video poker games and a one million-dollar jackpot game. (Jackpot Trigger is played with tokens collected while playing other games and can pay up to $1,000,000 on a single spin.) All games can be played on any computer, smartphone or tablet. One of the most popular is the new Coin Rush, a 5x4 slot game with crypto coins spinning on its reels. Its extra row increases chances for a winning combination and scatters can trigger free spins. CryptoSlots also recently introduced a monthly Crypto Lotto, tickets for which can be earned as you play other games. The top prize is a progressive amount of at least $10,000. Available February 14-16, 2019 only. May be claimed up to 5X per day. Wagering requirement 35X. Valid for all games except $1,000,000 Jackpot Trigger. Cryptocurrency, created by Slotland.com, has quickly become popular with online casino players since it’s quick, easy and safe to use and transaction fees are lower than other options.